Caravan packed the house last night at Shepherds Bush Empire in London for a special treat of classics from the legendary album In The Land of Grey and Pink including a rare performance of the title track itself. The band and management wish to thank everyone for a sell-out show to remember. This entry was posted in CD, Gigs and tagged 2011, Land of Grey and Pink, Shepherds Bush on October 8, 2011 by caravan. It ‘was hard to get tickets but I did it! See you on the 8th of October at the Sheperds Bush Empire. The Stables website is showing that there are only standing tickets left for 13 October . . . .
Ágain after the excellent Metropolis gig we’ll travel with the four of us from the Netherlands to London. We’re looking forward again to a wonderfull evening. Can’t wait for the Shepherds Bush gig! Last time out I was at the Metropolis and I stayed in a very borderline B&B in Chiswick. This time I decided to push the boat out and stay in a very borderline B&B in Shephers Bush. Where but for Caravan would I tolerate bed-bugs and a free breakfast available too late to catch my train back to Bournemouth the next morning? Absolutely brilliant! Great night fantastic atmosphere loved it. I agree great gig and no bed bugs either! It was an amazing concert. Sadly I had to leave early to catch a train back to Worthing so I missed the encore. I was so pleased they opened with Memory Lain as I think that track is a great opener for a gig. I pre ordered the cd and I sincerely hope that the live cd captured the great sound and atmosphere. Hopefully the guys will do another tour real soon. Many thanks for posting the videos Phil ! A great taster for the gig in Edinburgh on Saturday . Just returned from the Holmfirth gig. Absolutely brilliant. The place was packed out. And as usual Caravan did not disapoint.This is the 57th time I’ve seen Caravan and they are just as refreshing now as when I seen them first in 1969. Ever…yone goes on about the early incarnation of Caravan. But then they had mediocre p.a. systems and poor amplification. I think today they have a fuller and more solid sound. So a good night was had by all. so keep up the great work lads and I’ll see you in Edinburgh. Just like to say how brilliant Caravan were at Empire O2 on 8th Oct I took my son and son in law they were probably the youngest there! 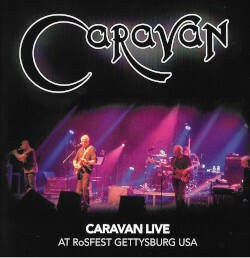 but were blown away by Caravans performance as well.Having been a lifelong fan of Caravan since their humble beginnings I can only say that after many many times of seeing them live they are as good as ever. Looking forward to the next time in the land of grey and pink.